In August my wife and I traveled to Los Angeles (well, Orange County, really) for my cousin’s wedding. We planned on spending a few extra days in the city afterwords, and the Petersen Automotive Museum was at the top of my sightseeing list. My wife Julie broke out the DSLR and took some pretty amazing photos that I thought I’d share with Oppositelock. One of the Petersen’s current special exhibitions is “Precious Metal” - all significant cars from different eras rendered in silver paint, including that 1957 625/250 Testa Rossa above, a McLaren F1, Bugatti EB110, a M-B W196, and a Scarab. 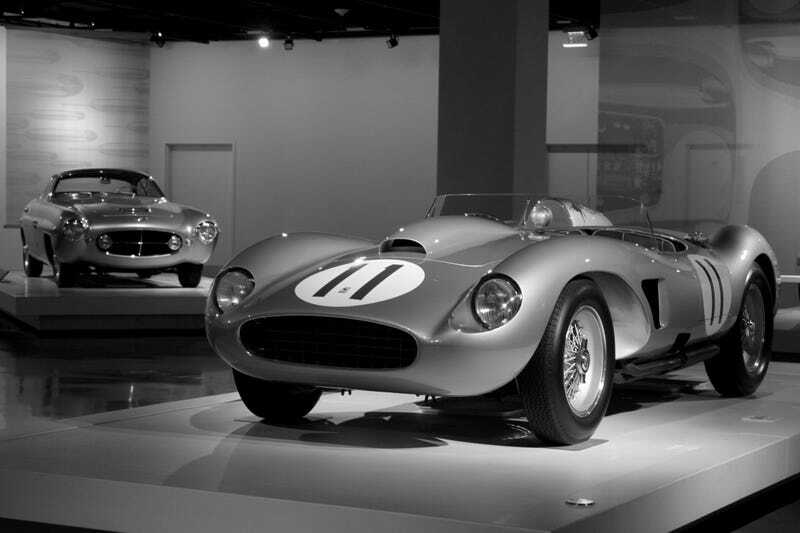 It was my favorite part of the museum, and I think these cars in particular take to black and white. If you find yourself in Beverly Hills, the Petersen is well worth the $15 gate fee. I’m that one guy who reads all the wall text. This 1954 Ferrari 375 MM Scaglietti made me feel funny things. Lots of shots of me looking pensive. All Photos © Julie Edwards. Check out more of her work here, and our blog here.